One of my goals for the rest of this year is to catch up on all of the DC Comics movies, TV shows and animated features. My viewing of these will be erratic because I haven’t yet found the chronological listing – if such a list exists – that would allow me to exercise my OCD and watch them in order of release. Some whose own OCD takes a more active form than mine should prepare such a list and send it to me. Believe me, I would herald that individual’s greatness in a future installment of this column. 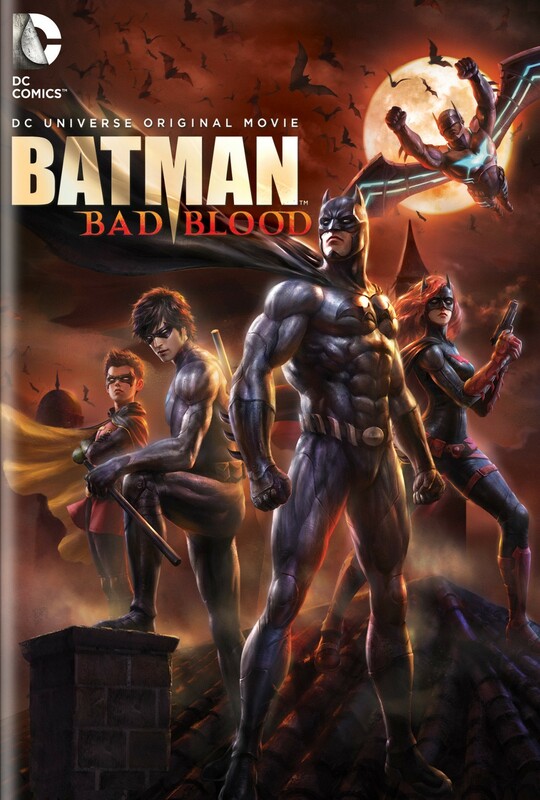 Batman: Bad Blood [Warner Bros. Animation/DC Comics; approximately $13] came to me through my local library. The 2016 direct-to-video release was directed by Jay Oliva who’s helmed many other animated features and worked as a storyboard artist on various live-action films. He’s got chops. It was written by J.M. DeMatteis, writer of countless comic books as well as many episodes of both animated and live-action. Okay, you probably could count all the comic books he has written, but you’d be counting for two or three days. That summary is close enough for government work, but leaves out a number of salient points. The feature includes the origins of both Batwoman and Batwing with a teaser shot of another hero at the end of the film. It also has somewhere in the neighborhood of a dozen super-villains, including the Electrocutioner, Tusk, Firefly, the Mad Hatter, the Calculator, Killer Moth and more. I’m hoping that a whole bunch of comics writers and artists got some money for the appearances of their creations. 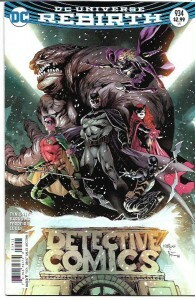 The voice actors include Jason O’Mara as Batman, Yvonne Strahovski as Batwoman, Stuart Allan doing a darn fine job as Damian Wayne, Morena Baccarin, John DiMaggio, Robin Atkin Downes, Ernie Hudson (who I really want to work with some day because he’s my favorite Ghostbuster) and others. There is nary a false note among all these talented performers. Wanting to avoid spoilers, all I’ll say about Batman: Bad Blood is that I enjoyed it. It threw some surprises at me. It had some real character growth. I’m adding it to my Amazon Wish List because I’d like to watch it again sometime and share it with others. It’s my pick of the week. 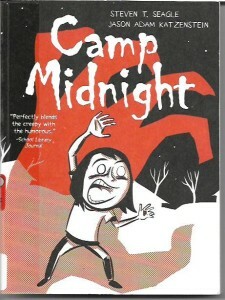 Camp Midnight by Steven T. Seagle and artist Jason Adam Katzenstein [Image Comics; $16.99] is the creepy, funny and ultimately moving story of what a young girl named Skye did on her summer vacation. Her parents are divorced, her dad’s new wife doesn’t seem to like her and she just got on the wrong bus for summer camp. Which takes her to a camp where activities don’t start until midnight and where all the other kids are monsters. Chalk up a win for Free Comic Book Day because it was the free excerpt of this graphic novel that got me to seek out the full edition. Skye’s afraid to let the other campers know she’s an ordinary human being. Mia, the first friend Skye makes at the camp, doesn’t want anyone to know what she really is. So, alongside the creepy stuff and the funny stuff, we also get some not-remotely-preachy lessons about being yourself and standing up for yourself. The targeted age range for this book is 9-12, but it’s smart enough to be enjoyed my older readers. Even dinosaurs like me. Seagle’s writing is sharp and his characters come alive in dialogue that never “sounds” wrong to me. Katzenstein’s art – his cartoons have appeared in Newsweek and The New Yorker – isn’t typical comics stuff, but it flows nicely and tells the story well. This could be a contender for next year’s awards. I like Camp Midnight a lot. It should be in every public and school library that wants to build a graphic novel collection for readers of all ages. It would be a terrific gift for younger readers and, for that matter, older ones. Definitely recommended. 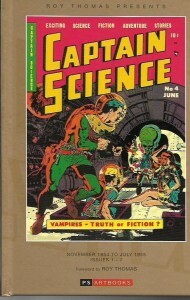 Roy Thomas Presents Captain Science [$69.99] is the latest vintage comics collection from the UK’s PS Artbooks. Originally published by Youthful Magazines, the volume reprints all seven issues of the title from November 1954 to July 1955. Captain Science is a brilliant scientist who is given the advanced scientific knowledge of a dying race and an electronic brain that can alert him to any threat to our world. He’s joined in this fight by the young, very rich Rip Gary and the lovely Luana, who turned against her evil father to help the good Captain save our planet. It’s a fairly typical group of heroes with the somewhat troubling sidebar that Rip was mentally conditioned by an alien to devote his wealth to the service of Captain Science. Each issue has two stories of the Captain and two other stories. An interplanetary detective named Brant Craig appears in most issues. Captain Science’s villains are evil alien conquerors and the gooey monsters who love them. Brant mostly brings criminals to justice. As for the non-series stories, they are often the best story in an issue. Some notable examples: “When Time Stood Still,” “The Glower of Death,” “The Hangman’s Son,” and the amazing “World War III with the Ants.” That last one could and should be expanded into a full-length graphic album, a novel or even a movie. 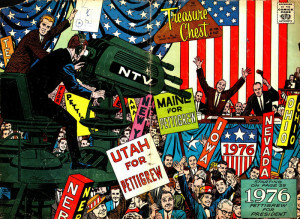 The writers of these comic books have not yet been identified, but the artist roster includes Wally Wood, Walter Johnson, Don Perlin, Gustav Schrotter, Joe Orlando, Myron Fass and Harry Harrison. The book also features a foreword by editor Thomas. 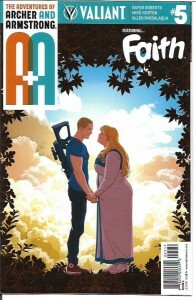 With issue #8, the name of the title changed to Fantastic. The last two Captain Science stories and the last Brant Craig adventure ran in that issue, but are not included in this hardcover. 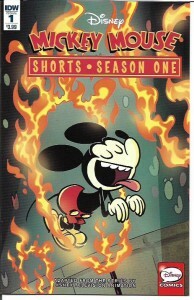 Fantastic ended with issue #9, which had four non-series anthology stories. I’m hoping PS Artbooks reprints those two issues of Fantastic in a near-future collection. You know the drill on these PS Artbooks volumes. Though all of the reprinted comic books might not be classic, the books are wonderful additions to our comics library. In this case, fans of Wally Wood and Joe Orlando will want the bool for their artwork. Captain Science was good fun. On that basis, along with the afore-mentioned historical value, I recommend it. Black Lightning. Before we get to this week’s reviews, I should say a few words to the three or four comics fans who somehow have not seen the latest news about the character I created for DC Comics. I’ll try to keep these remarks brief because, even at 65 years of age, I think people should try new things. DC Entertainment has received a pilot commitment from Fox on Black Lightning. This means – and I hope I have this right – DC will be making a pilot for a Black Lightning TV series. 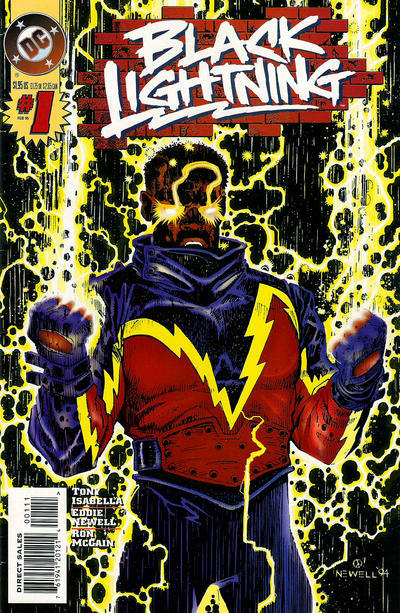 If Fox loves this pilot, Black Lightning will get his show. This commitment is due to the hard work of Greg Berlanti, show runners Mara and Salim Akil, and Geoff Johns, who is a hero to the Isabella family. I’ve spoken with Mara and Salim. We got along famously. Their take on Black Lightning is well within what I consider the core values of my creation. I’m excited about their plans. There will be more Black Lightning announcements coming. I believe you will like them as much as I do. For several years now, KaBoom!, a division of Boom Entertainment, has been publishing original Garfield comic books based on the Jim Davis comic strip that is a favorite around the world and here at Casa Isabella. Don and Maggie Thompson introduced me to Garfield way back in 1980 when Ballantine Books published the first of over 60 collections of the strip. I loved the format of the book and I loved the strip itself. Garfield has been a daily part of my life ever since. I prefer my Garfield comic books like Garfield prefers his lasagna: in big delicious chunks. Garfield Volume Four [July 2014; $13.99] was my latest mirthful meal. It collects material from Garfield Pet Force Special #1 and Garfield #13-16. The stories are written by Mark Evanier, who is one of my favorite writers and oldest friends, and Scott Nickel, whose comic strip Eek! is also a favorite of your friendly neighborhood tipster. Art is by Gary Barker with Mark and Stephanie Heike, Andy Hirsch, Courtney Bernard and Genevieve Ft. As I will be saying many nice things about Evanier, let me assure you my reviews aren’t influenced by my friendships for those whose work I write about. Mark has never once paid me to say nice things about him. He has me on a retainer. Drum roll. “Pet Force” cats Garfield, Odie, Nermal and Arlene as super-heroes. In a story by Nickel, the team is disbanded under the influence of the emotion-controlling Hater. In a second story by Evanier, based somewhat on his experiences with shady contractors, the team faces a cosmic, world-destroying contractor. These tales are a very funny parody of super-hero comics. But it’s the purer Garfield stories I love best, the stories that, despite starring a sentient cat, deal with real-life things like diets, cranky neighbors, lateness, self-esteem, inflated ego, cut-throat business competition and such. Evanier has a knack for this kind of story and his artists do fine work visualizing them. Garfield Volume 4 is my pick of the week. Not only was it big fun to kick back and enjoy it from cover to cover, but it featured the kind of comics I read a second time to study how Evanier and crew made the stories work. The entire KaBoom! 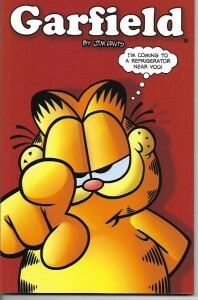 Garfield series gets my highest recommendation. 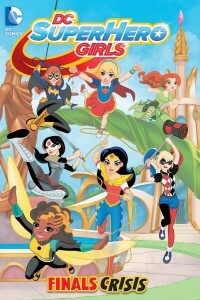 DC Super Hero Girls: Finals Crisis [$9.99] by Shea Fontana with art by Yancey Labat is a 128-page, 6″ by 9″ original graphic novel for readers 8-12 years old. It’s based on the animated series that has been an online sensation since it first launched. In this corner of the DC Multiverse, Super Hero High is where the teen versions of heroes and villains go to learn how to use their abilities effectively. The principal is Amanda Waller with Gorilla Grodd as her vice-president. The main characters include Supergirl, Wonder Woman, Bumblebee, Batgirl, Harley Quinn, Poison Ivy, Katana and others. It’s an amusing concept that can be enjoyed by younger and older readers alike. That said, I was disappointed in this particular adventure. While preparing for their finals, the young heroines are kidnapped, one by one, by a mysterious villain whose identity will not fool comic-book readers in the least. The girls defeat this villain by working together, a sweet little moral that ignores the fact that, even at this early stage in their training, every one of these young women should have been able to beat the bad guy by themselves. The moral drove the story and that hurt the story. DC Super Hero Girls is worth checking out. Even a flawed book like this one, it still entertaining. World of Archie Double Digest #61 [$4.99] is the new issue of the only Archie Comics title I still collect. I read a few of Archie’s standard-size comics like Archie, Jughead and The Black Hood, but the company just doesn’t speak to me as it did for so many years. No pun intended, the vileness that is Afterlife with Archie was the final nail in that particular coffin. 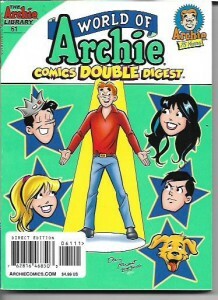 When I say I collect World of Archie Double Digest, that’s exactly what I mean. I have all 61 issues. I started collecting it because it was reprinting classic comics like Cosmo the Merry Martian and the pre-Pussycats Josie. It threw in some oddball stuff like Young Dr. Masters and Seymour, My Son. I kept collecting it even after it ran out of that material because it was still reprinting fun stuff by writers Frank Doyle and George Gladir – my two favorite Archie writers – and great artists like Dan DeCarlo, Stan Goldberg, Harry Lucey and others. The title has seen better days, but it still has enough of the good stuff to keep me buying. The high points this time out are the second chapter of a spy spoof by Tom DeFalco, a fun “Reggie gets his comeuppance” story written and drawn by Al Hartley, the usual fun scripts by Doyle and Gladir, and an “Archie 1″ tale – the Riverdale kids in prehistoric times – that ends on a pun that made me groan in delight. In the past, I’ve recommended classic Archie comic books as a terrific change of pace from the grim and grittiness of so many super-hero comics. I still think World of Archie Double Digest works in that regard. Check it out sometime, especially if you can get hold of one of the earlier issues. First up today is the frankly disappointing Outer Limits: The Steve Ditko Archives Volume 6 [Fantagraphics; $39.99]. The hardcover book collects 38 Ditko-drawn stories that were originally published by Charlton comic books dated 1958 and 1959. My disappointment doesn’t lie with the volume itself, but rather with the substandard stories presented therein. Blake Bell’s introduction is informative, but his critical praise of Ditko’s work on these stories strikes me as excessive. But his historical insights and his inclusion of pages Ditko drew when he once again started getting work at Marvel helps put these stories in context. Ditko rarely seems inspired by the stories reprinted here and that shows in his mostly journeyman art on them. It’s also quite likely Charlton’s notoriously low rates played a factor. Sometimes, then and now, the art of the comics art form takes a back seat to more mundane financial considerations. There are, as you would expect, flashes of Ditko brilliance. “The Time Chamber” has a large final panel “shot” through a window and it’s stunning. Even some of the more minimalist art has a certain cleverness in Ditko’s execution of the drab stories he was given to illustrate. Given how poorly written and often wildly unfocused the stories are, I’m not about to fault Ditko for not doing more with them. The story comes first and, if that’s not there, even if the art looks great, the story still falls flat. Great comics have both great stories and great art. Ditko seems somewhat energized by these western assignments. Though I can’t speak to the accurate of the horse anatomy, there is both beauty and power in Ditko’s depictions of Black Fury. The stories are also better written than most of the sci-fi efforts included in this volume. The back cover blurb claims the sci-fi stories “tapped into Middle America’s fears and aspirations during the 1950s Cold War era and the beginning of the space race with Soviet Russia.” This is a bit of an exaggeration, but worth discussing. While the volume has some of the knee-jerk jingoism that would become more common at Charlton and other publishers during the 1960s, there are also stories which clearly oppose aggression from both the United States and Russia, or their otherworldly counterparts. That nuance would fade from the Charlton comics in the 1960s. The bottom line is that Ditko is one of the most important creators to have worked in comic books. My disappointment in these reprinted efforts doesn’t change their historical importance because, at his best or at his most mundane, Ditko remains a key figure in comics. 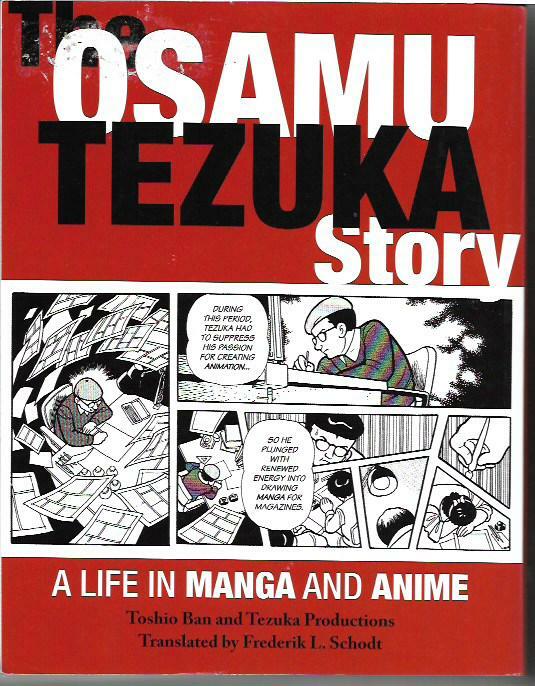 His work, even this work, needs to be available to today’s comics historians and readers. 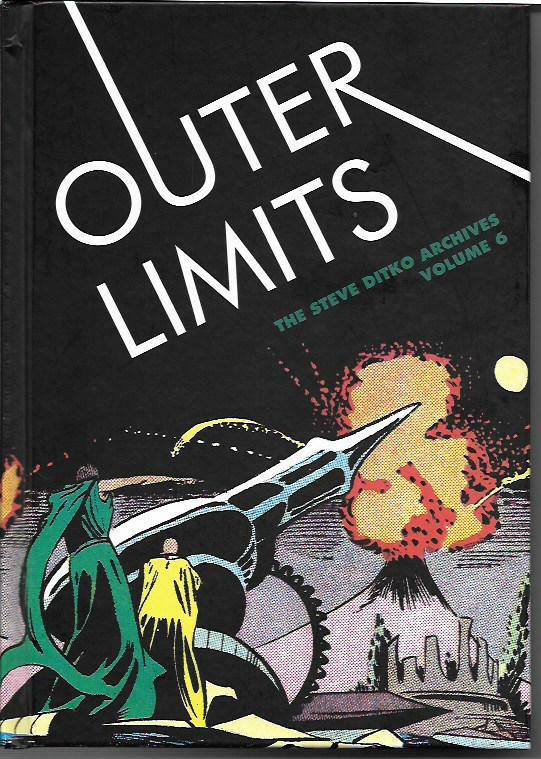 I recommend Outer Limits to avid Ditko fans and also to those whose interests lie more with comics history in general. Bell is likely limited to reprinting public domain comic books, but wouldn’t it be sell if Marvel and other publishers either granted reprint rights to this dedicated history or published their own volumes showcasing the entirety of Ditko’s work for them? I would happily make room on my bookcases for such volumes. Ever since I started writing comic books, I’ve been extraordinarily fond of what Don and Maggie Thompson deemed “done-in-one” stories. As comic books, especially super-hero comic books, shifted to story arcs and serials, the art of telling a satisfying super-hero tale in one standard-length issue became something of a lost art. While done-in-one comics never faded entirely, they became somewhat rare. These days, when I come across issues that tell a satisfying tale that can stand alone, when those issues are as well done as those I’ll be writing about in this column, I rejoice. 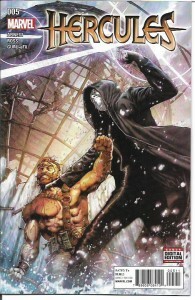 A+A: The Adventures of Archer and Armstrong #5 [Valiant; $3.99] is one such done-in-one delight. It is the story of the first date of martial artist Archer and the super-heroine Faith and I suspect it had me grinning from start to finish. Sharks and who wear shark costumes that aren’t nearly as stylish as those of Left Shark and Right Shark. Yeah, it’s goofy, but, really, isn’t young love always goofy when you do it right? The story was written by Rafer Roberts who, assisted by the “What Has Gone Before” content on the inside front cover, does a terrific job making the issue accessible to new readers without being real obvious about it. Penciler Mike Norton provides smooth visuals and storytelling. The human stuff is very real, the super-hero stuff is realistically dynamic. Colorist Allen Passalaqua and letterer Dave Sharpe also do fine work here. 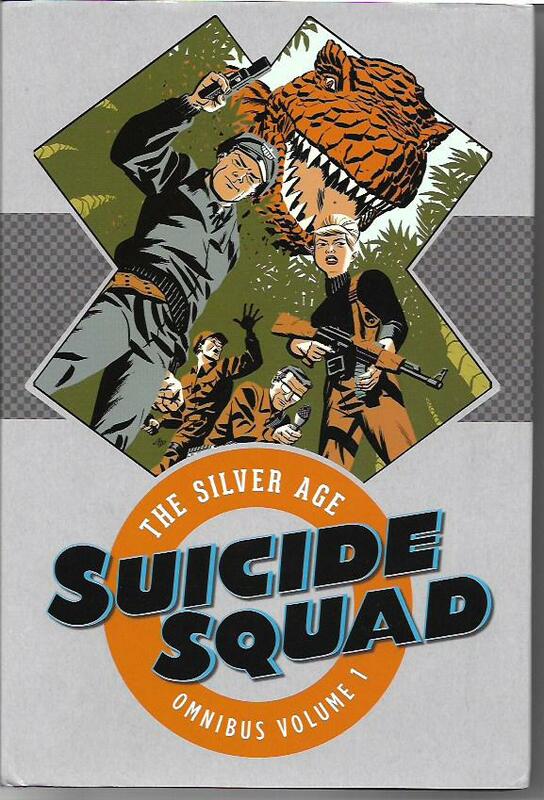 This is a swell comic book on every level. I loved it and I recommend it. There’s a lot going on in Marvel’s Scarlet Witch. As seen in Doctor Strange and other Marvel titles, magic and witchcraft are broken. In addition, Wanda Maximoff has met her real mother and is trying to learn more about her. However, in the midst of all this ongoing inner turmoil and multidimensional peril, Scarlet Witch #8 [$3.99] by James Robinson with art by Tula Lotay is a downright wonderful done-in-one story of Wanda telling her therapist what’s weighing on her mind lately. There is magic in the story and there is serious self-reflection and there is a surprise which absolutely delighted me for a reason I can’t say without spoiling said surprise. This is a really great comic book. 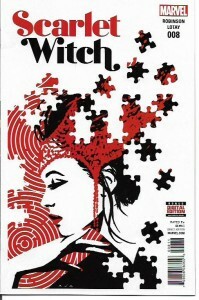 In a fictional universe laboring under one ill-considered “event” after another, at a comics publisher who routinely uses the deaths of characters as a marketing tool, at a company engaged in childish pettiness over its movie rights, Scarlet Witch #8 is a sensational done-in-one issue. That’s why I’m naming Scarlett Witch #8 as this week’s pick of the week. Newspaper comic strip creators fascinate me. They always have, even though the first one I met was a jerk. That fascination grew when, a few years back, I started writing for or other assisting several of them. My admiration for what they accomplish, day in and day out every day of the year, has only grown since then. Robb Armstrong’s Jump Start, which is about a married couple with kids, is one of my favorite strips. Joe Cobb is a police officer. Marcy Cobb is a nurse. The supporting cast is as likeable as they are. Which wouldn’t mean beans if Armstrong’s writing and drawing weren’t as excellent as they are. 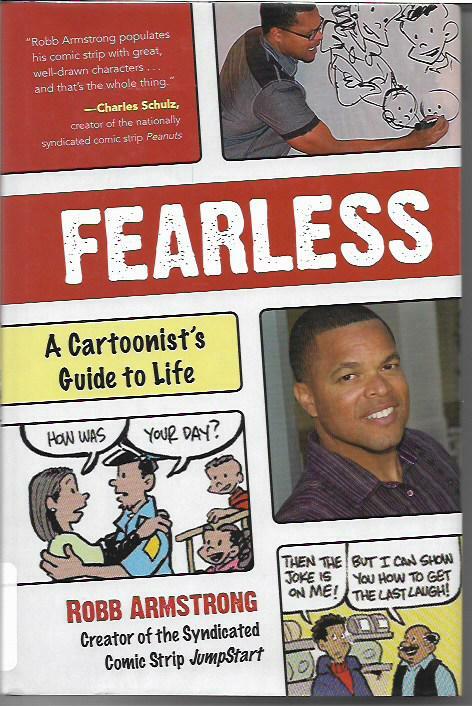 Fearless: A Cartoonist’s Guide to Life [Reader’s Digest; $24.99} is a three-in-one book by Armstrong. It’s a third drawing lessons and a third autobiography and a third life lessons. The drawing lessons are challenging but not complicated on account of Armstrong knows his craft and is able to explain it in a manner even us non-artist types grasp. Each drawing lesson is followed by a portion of his life story. At the end of each chapter, we get a life lesson combining what we have learned from the drawing lesson with what Armstrong learned (or didn’t learn) at each stage of his life. I was amazed at how well it all ties together. Armstrong is a person of faith, but his Christianity is truer than most in its acceptance of the world around him. His older brother converted to Islam and Armstrong couldn’t be more complimentary in praising his sibling’s commitment to that faith and how it has made him a better and stronger man. God doesn’t divide us; that’s a job for foolish human beings. The book also includes a section on art supplies and a gallery of some of Armstrong’s favorite Jump Start strips. Oh, dear, I think I will now have to buy as many traditional Jump Start collections as I can find. I do love this strip. “Inspirational” is an adjective that gets tossed around a lot, but Fearless deserves to wear it proudly. In the middle of my own very busy schedule, reading this book recharged my energy. Which is why it’s my pick of the week. Irwin Allen’s Lost in Space: The Lost Adventures #1-3 [American Gothic Press; $3.99 per issue] features a comics adaptation of “The Curious Galactics,” an unproduced script by Carey Wilber. He wrote several episodes of the TV series, the famous “Space Seed” episode of the original Star Trek and lots of other TV shows in the 1950s through the 1970s. The script was adapted by Holly Interlandi with art by Kostas Pantoulas. This is huge news for avid Lost in Space fans, but I can’t really include myself in their number. I didn’t hate the show. I was a fan of all the cast members with some of them – Guy Williams, Bill Mumy and June Lockhart – being among my favorite TV stars. I watched the show up to the point where the stories just got too silly for me. Also, I have a vague memory that, at one point, it was scheduled against a show I liked better. Maybe even the original Star Trek. “The Curious Galactics” is more serious than the later episodes of the series. It involves some aliens – Hey! Wouldn’t the Robinsons be considered aliens out there? – testing John Robinson, Don West and Will Robinson to see if they are intelligent beings as defined by their own emotionless standards. It’s not a bad premise, but it simply isn’t three issues worth of premise. The result is a story that drags to its conclusion. The writing is so-so as the art. The story’s conclusion is flat and the aliens never quite make sense. The human characters are stiff with faces that often look like they were lifted from a press kit’s photos. When the characters do show some emotion, it’s exaggerated. 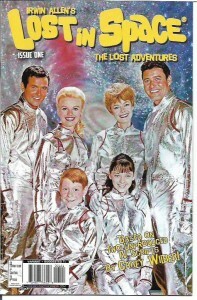 If you’re an avid must-have-it-all Lost in Space fan, you will want these comic books. If you’re not, give them a pass. 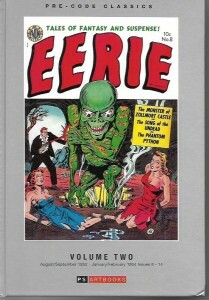 Pre-Code Classics: Eerie Volume One and Volume Two [PS Artbooks; $59.99 and $64.99] reprint issues #1-14 of the 1950s horror comic series from Avon Periodicals. 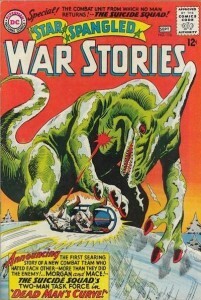 Avon had published a one-shot comic with the same title in 1947, but didn’t begin the ongoing series until 1951. 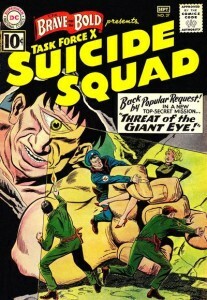 The title ran for 17 issues, but the last three issues were reprints of the first three issues. 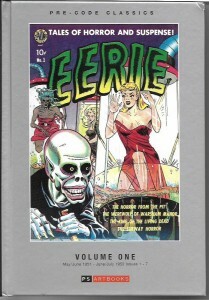 Eerie starts off with the usual horror comic fare: werewolves and vengeance-driven ghosts and other undead creatures. The writing is adequate, but only occasionally rises above that. We know Sol Cohen was the editor of the title, but the names of the writers have yet to be uncovered. Some of the better stories would include issue #2’s “The Thing from the Sea” (art by Wally Wood); “The Stranger in Studio X” from the same issue; issue #3’s “The Mirror of Isis” (art by Joe Kubert); and “Cremation of Evil” from issue #4 (art by Gene Fawcette). 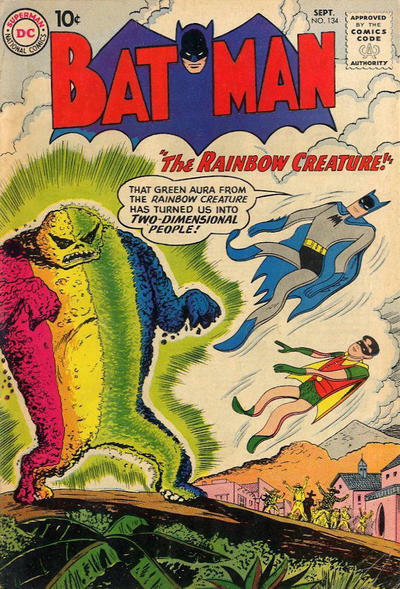 More unusual monsters would appear in issue #8: “The Phantom Python” and “The Curse of the Bulaga.” issue #11 would unleash “The Anatomical Monster” while #12 would feature an issue-length adaptation of Bram Stoker’s Dracula. The basic plots of Eerie’s stories are all good, but the execution was mostly journeyman. The art on these comics is a mixed bag. There are some first-rate jobs from the afore-mentioned Wood, Kubert and Fawcette, as well as Fred Kida, Louis Ravielli, Manny Stallman, Carmine Infantino (hurt by so-so inking), George Roussos, Harry Lazarus, Everett Raymond Kinstler and Alvin C. Hollingsworth. But there are two many stories by Norman Nodel, Vince Alascia and even lesser lights. These hardcovers aren’t cheap, but they are way less expensive than if you tried to buy the original issues in decent shape. My usual recommendation is that fans of pre-code horror and historians will want them. Less committed readers will probably want to pass them by. As for me, I’m delighted to have them. 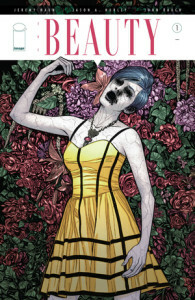 First up this week is This Magazine is Haunted Volume One [$59.99] from PS Artbooks. This was Fawcett’s first supernatural anthology, which the company that gave us Captain Marvel published from 1951 through 1953. 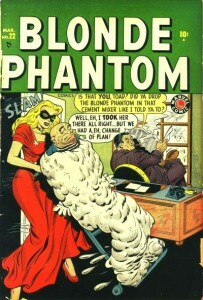 When Fawcett got out of the comic-book business, the title was sold to Charlton which continued the series from 1954 to 1956. This volume reprints the first seven issues [October 1951 to October 1952]. 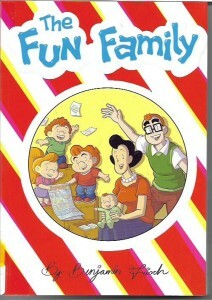 The title was created by legendary comics creator Sheldon Moldoff. 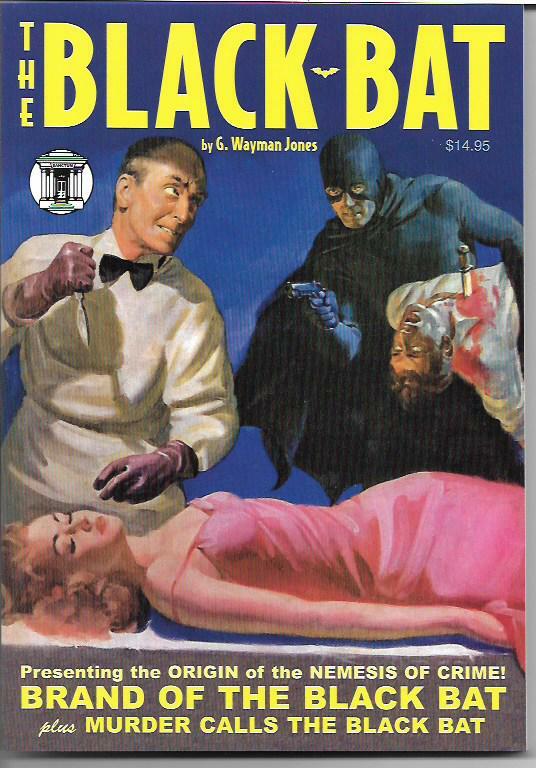 He pitched it to Fawcett, who initially passed on the very idea of getting into horror comics. EC Comics was more receptive, but, as Moldoff would later say in interviews, EC reneged on a dale to pay him royalties on their horror titles. By this time, with those EC books doing very well, Fawcett took the plunge. 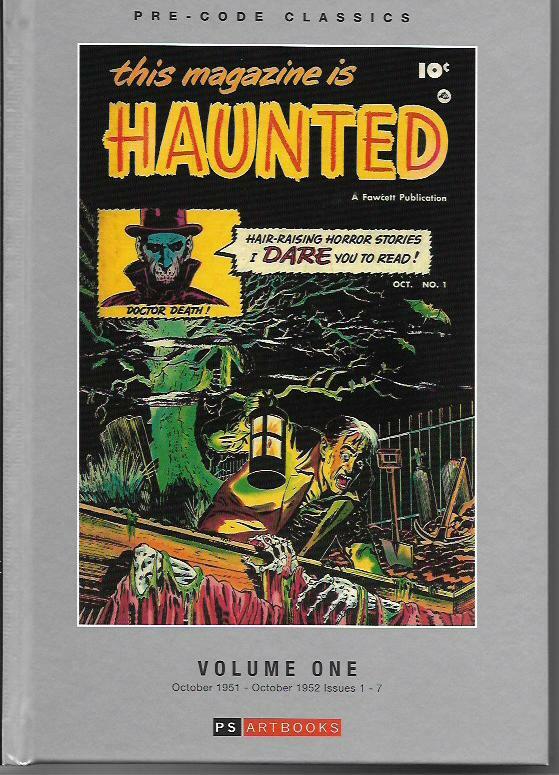 Edited by Will Leiberson and Al Jetter, Haunted never went in for gore. While the stories certainly inflicted some gruesome fates on many of their protagonists, those fates were always depicted with restraint. The stories themselves were a mix of the usual ghosts and unearthly creatures. There were some tales inspired by the surprise endings of the renowned O. Henry – You probably read his “The Ransom of Red Chief” in school – and some which were influenced by horror movies. The stories aren’t credited, but we know Paul S. Newman wrote for the magazine and it has been suggested Roy Ald also did. There are some terrific artists on these stories. Besides Moldoff, these included George Evans, Bernard Baily and Bob Powell. There’s also work by the unknown artist which the Grand Comics Database has dubbed “Jokerface” for his habit of drawing minor characters with cartoony elongated faces. Most of the stories reprinted in this book are, at the very least, readable. Several are excellent. In “The Green Hands of Terror,” a scientist creates disembodied, seemingly sentient limbs that live on after he’s murdered. “The Slithering Horror of Skontong Swamp” deals with swamp creatures. “The Ghost of Fanciful Hawkins’ is as mad a ghost story as I’ve seen. In “The Grim Reality,” which could be my favorite of this volume’s stories, a con man’s manufactured legend comes to life. Though not as expensive as the original EC horror comics, the first seven issues of This Magazine is Haunted – in merely good condition – would set you back over three hundred bucks. At less than a fifth of that cost, this reprint volume is far more economical. If you’re a fan of comics history in general or 1950s horror in particular, this hardcover volume is a bargain. 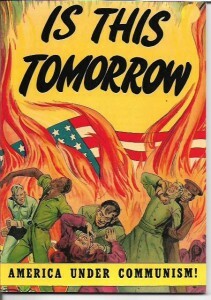 Is This Tomorrow [Canton Street Press; $8.95] is a digest reprint of the legendary anti-Communism comic book originally published by the Catechetical Guild Educational Society. It has been digitally colored and restored by Canton Street Press. No. It isn’t. But maybe you’ll have better luck with all the other absurd conspiracies scooting across our national conversations like dogs trying to wipe themselves on the carpet. 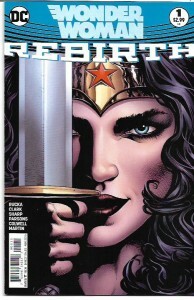 There are no credits on the comic book itself, but they came later when the story was reprinted in Catholic Digest. The writers were F. Robert Edman and Francis McGrade. “Script credits not in the comic, but show up when the story was reprinted over three issues of Catholic Digest (information from Ken Quattro via the Comics History Exchange page on Facebook, posted August 11, 2015). “Charles M. Schulz pencil, inks, and lettering credits come from Schulz himself in an interview with Shel Dorf, in Comics Interview (Comics Interview Group, 1983 series) #47 , page 15 and in Schulz and Peanuts: A Biography by David Michaelis (Harper, 2007 series), pages 161 and 167, as reported by Jean Paul on the Comics History Exchange page on Facebook, August 13, 2015. Whatever my views of this comic book from 1947, I consider it to be historically important. Canton Street Press did a first-rate job restoring it and the smaller size of the reprint doesn’t hurt the readability of the book. If you could find a merely good condition copy of this comic book, it would likely set you back about thirty dollars. Nine bucks seems like a great deal to me. 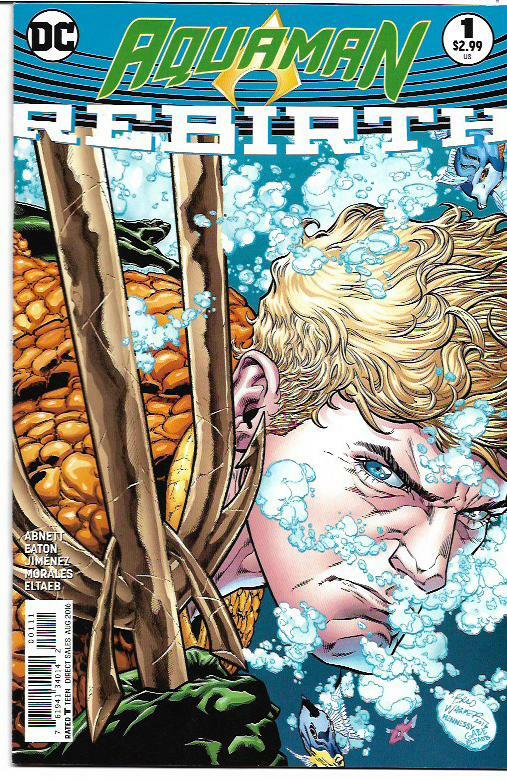 The “DC Universe Rebirth” continues to entertain and intrigue me. 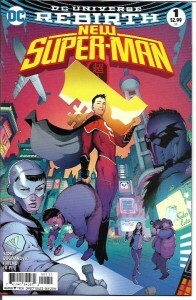 Case in point: New Super-Man #1 [$2.99] by writer Gene Luen Yang with artists Viktor Bogdanovic and Richard Friend. This new series takes place in Shanghai, China. Kenan is a bully who delights in tormenting pudgy Lixin. Kenan is a working-class kid whose mother died in the crash of a commercial jet. Lixin’s father is the CEO of that airline. Kenan knows he is being a creep and struggles with it. When Blue Condor, a villain who terrorizes the rich and powerful, goes after Lixin, it’s Kenan who comes to the boy’s rescue. Before long, Kenan becomes a minor celebrity, is praised for his courage and recruited by some weird scientists to become a super-hero. When I read this issue, I felt some of the thrill I felt when, as a kid, I would read the first issue of a new super-hero comic book. I love that it’s set in Shanghai. I love the conflicted characters. I love the conspiracies swirling delicately in the background. This is a well-written comic that looks great and flows well. It could be the Firestorm or Nova of a new generation. New Super-Man #1 is my pick of the week.